Sleep…oh how I miss sleep. It is one of my favorite past times, a long lost friend whom I long to catch up with. I haven’t slept through the night in over 6 years. First, my pregnancy with M was full of 9 months of all-day sickness and frequent infections, along with a terrible chronic case of tonsillitis that my doctors couldn’t manage to properly diagnose until 9 months after it started when my jaw locked shut from the swelling. No sleeping with all that pain. Then M was born screaming…and never seemed to stop. The night after she was born, after crying pretty much non stop all day, I had finally gotten her to sleep in my arms. Daddy came to visit & insisted on holding his precious girl…which immediately started another hours along screaming marathon. She actually hated being in the car as an infant and would not fall asleep. Nor would she sleep in the swing, bouncer, carrier, cradle or of course her crib. She wouldn’t even co-sleep. She would only sleep while nursing (pacifying) while I held her sitting up in the glider rocker. As she got older she would fall asleep after a lot of fuss, but woke often (not sleeping through the night even once until after she turned 5) and was ready for the day by 5am at the latest. When M was 2, A was born. She slept OK (none of my kids were great sleepers as infants but much better than M) but did not fall asleep on her own or very easily, and woke through the night to eat. 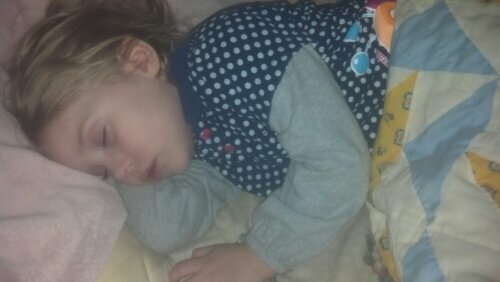 I nursed her past age 2, so a lot of the night waking was due to my own decisions. She did finally sleep through the night some after she weaned, but she still does not sleep through the night regularly. And both little girls are usually up by 6am, 6:30 at the latest no matter what day it is, asking for breakfast. Then there is my chronic insomnia, likely caused by so many years of listening for and waking up with babies and my body can’t figure out how to sleep through the night. I sleep lightly and wake every hour or 2 for no reason. When my anxiety is high I can’t fall asleep at all. And my husband, love him, snores, even after surgery to correct a deviated septum. Tonight I had hoped to get to bed early, even though I had some homework & other things to take care of. By 10pm was my goal. Well, it’s now 10:30 and I’m just writing my blog post. A had a night terror. If you have never experienced one, they are awful. K had them for years, past the age where they are normal, but fortunately they stopped a few years ago. A generally only has them when her asthma is acting up. They scream and cry and flail around, in some terrible nightmare. They even open their eyes and look at you (though they can’t see you) and cry for Mommy, unable to be soothed by your touch & voice because they don’t know you’re there. It is impossible to wake them and you just have to sit and watch helplessly until it subsides and be there when they wake up just enough, then fall back to sleep. Here’s wishing you a long, restful night of sleep!